Collects and visualizes information on temperature, luminance, humidity, and motion sensor through a wireless system. Can control energy by using HA control or outlet control terminal. No need for wiring thanks to employment of ZigBee® wireless and power line communication. The Japanese energy saving law was revised in 2008 and went into effect in 2010. In the past, only bases (in business units such as factories, offices, and stores) were subject to energy management. After the revision, however, businesses (operators) consuming a specified amount of energy are subject to management. Therefore, convenience stores, restaurants, and companies with many offices and factories that did not have any duty to conserve energy and make a report before the revision are now regulated and must manage energy consumption at each base and report to the government. Application example of upper layer network * Building upper layer network is an option. 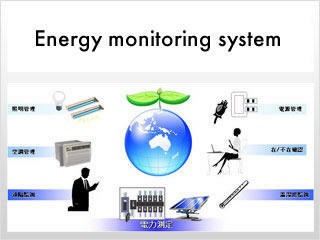 Energy consumption can be managed from a remote location via Internet. By connecting the energy monitoring system to LONWORKS® via a gateway, sensed data can be used to control lights and air conditioners. When a PHS modem is connected, events can be transmitted via e-mail to a cell phone without using the LAN of your company. When an ASP service is used, data collected by the energy monitoring system can be stored on the ASP data server so that sensor information can be checked and managed from a remote location at an ASP service charge of several thousands of yen per month. * Web Sensing is an ASP service provided by Marubeni OKI Network Solutions, Inc. For details, consult Ad-Sol Nissin. Offices, stores, factories, buildings, hospitals, schools, laboratories, houses, etc. Those who have purchased this product that uses ZigBee® will be served with a sample application (supporting Windows XP) that can be installed on a PC. By starting this application and turning on the terminal, sensor information is immediately collected, so that you can start visualization of energy and the environment right away. In addition, Ad-Sol Nissin supports customization of sensors that are not included in the lineup. For details, consult Ad-Sol Nissin.